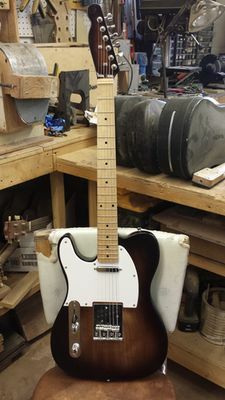 It was my first time building a guitar and it turned out well but I had guidance. Recently, I decided to try and put one together on my own but I figured I’d start with something smaller. 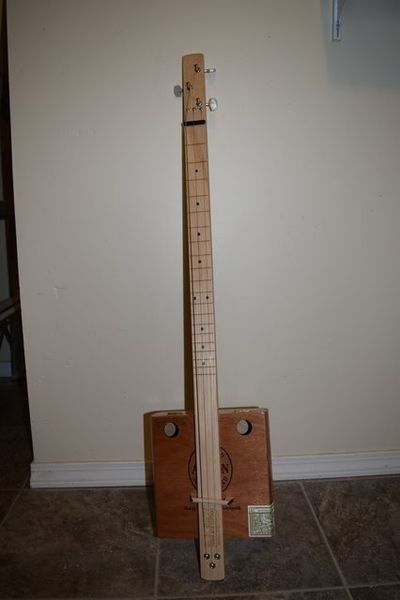 Last weekend, I was in my local music supply store and found a cigar box guitar kit. I thought this would be perfect so I bought it. I didn’t have time to build it right away, I waited until this weekend to give it a try. One thing that I considered was the fact that I play left-handed and I was pretty sure this was a right-handed kit. No matter, I wasn’t planning on keeping it for myself, I was going to sell it. Something else I considered was that on the box, it said the kit could be assembled in an hour. I wanted to test that out and see if I could do it in that time. I had a better idea of what the setup was going to be after I saw the parts. 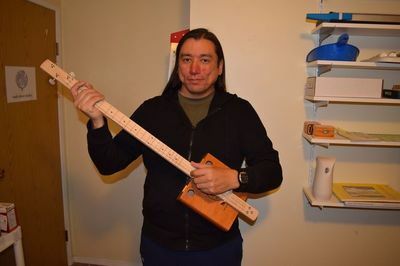 I didn’t know a lot about cigar box guitars but I knew there were two basic types: regular ones that are played like regular guitars and ones played as slide guitars. It was looking like this was a slide guitar, which wasn’t really what I was expecting. Also, I’m not really a slide player but I thought I’d give it a try. This guitar isn’t for me, anyway. The first thing I had to do was install the ferrules. These are metal sleeves that keep the ball end of the string in on the bottom of the guitar and keep the strings from digging into the wood. They had a front and a back so I used a rubber mallet to install them. A rubber mallet is softer so if I miss, it’s not going to dent the wood. Also, it has a wider head so I don’t have to worry about hitting the ferrules dead on. 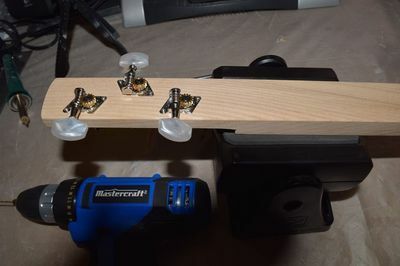 I ran into difficulties: there were pilot holes drilled for the tuning machine screws but for one thing, they were too small and they didn’t line up exactly. It was hard turning the screws so I wound up grabbing my drill and making the holes a little bit bigger. The box said you just needed a screwdriver to assemble the guitar but I anticipated I might need more tools so I had my drill on hand. Drilling the holes helped, they were still misaligned but at least I was able to get the screws all the way down. They also provided screws to guide the guitar strings to the tuning machine. That was something I hadn’t encountered before. The next step was to attach the neck to the body, this also proved to be difficult. 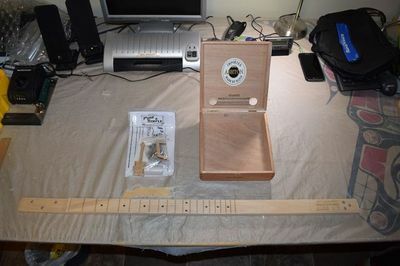 I had to open up the cigar box and line up the holes that were drilled into the top with the holes in the bottom of the neck. There was no easy way to position everything so I laid the cigar box on its side and lined up the bottom holes and started installing the screw. I had to turn the screw pretty hard for a long time and I couldn’t really see how I was progressing. I think the problem, once again, was small pilot holes. The first screw went in okay but the second one took forever, my arm and shoulder were actually sore from turning the screwdriver so hard and so long. After that ordeal, it was time to put the strings on. This is a 3-string guitar and I wondered what kind of strings they would provide. They’re basically the equivalent of the 2 thinnest strings on a regular acoustic and the thickest one. Before I tightened the strings, I installed a bolt that they supplied as a nut and the floating bridge. With the setbacks and stopping to take pictures of my progress, it took me about 2 hours to assemble this guitar. I tried to hold and play it as a right-handed guitar, but it felt awkward since I’m left-handed. I can play a regular right-handed guitar but it’s difficult because I have to use the opposite hand to press down the strings and reverse all my finger positioning. It takes a lot longer for me to play anything but I can do it; with a slide I found I couldn’t play at all. I think it’s not bad considering: 1) I’m not a slide guitar player, 2) I’m playing a right-handed guitar upside down, 3) it’s missing 3 strings that I’m used to having, and 4) I’m not a blues player. Overally, I’m pretty happy with the result. I ran into problems but I thought I might and I was able to deal with them. Building a full-sized guitar gave me some experience and prepared me for that. This experience also gave me a chance to use my new camera. I bought it about a month ago and I haven’t used it very much. It’s a little more advanced than the cameras I’m used to using so documenting this experiment gave me a chance to play around with my camera and get used to it. I’m going to try this again. There are other kits available, I’m thinking of getting one that’s more like a regular guitar. Basically, one that you can push the strings down onto the fretboard, you can’t do that with this one because it doesn’t have frets and the strings are raised a lot higher. You can buy other parts to customize them too, that should be fun to try.